Have you ever wondered where fashion gets its inspiration from? Is it influenced by music, film or even perhaps politics? If you’ve grown up in the last decade you’ll be surprised to know that what you think of as modern fashion might hn by taking you through the decades, the hottest trends of the time and influencers that wore them. Whether you’re after mimicking feminine silhouettes from the 50’s, a darling 60’s influenced mini hemline, luscious fabrics from the 70’s or boldly exaggerated 80’s embellishments, we’ve got the modern alternative ready for you to recreate. Channel some super glamorous royal vibes with a midi length cinched waist tulle chiffon skirt. Take your look from Hollywood to princess in a matter of minutes, perfect for a glamorously ethereal look at your next formal wedding function or gala ball event. To add a modern youthful edge to your look, team your full skirt with a fitted leather jacket. Italian film siren, Sophia Loren is known for her bountiful cleavage and gloriously slim waistline. Sophia’s alluring cinched waistline fashions made her a notable fashion icon that has undoubtedly stood the test of time. Her bold defined dark features and long brown hair made for an effortlessly demure look, making a simple spaghetti strap dress the perfect accompaniment. Today many of us make use of accessories such as thick corset belts to define and accentuate the waistline. 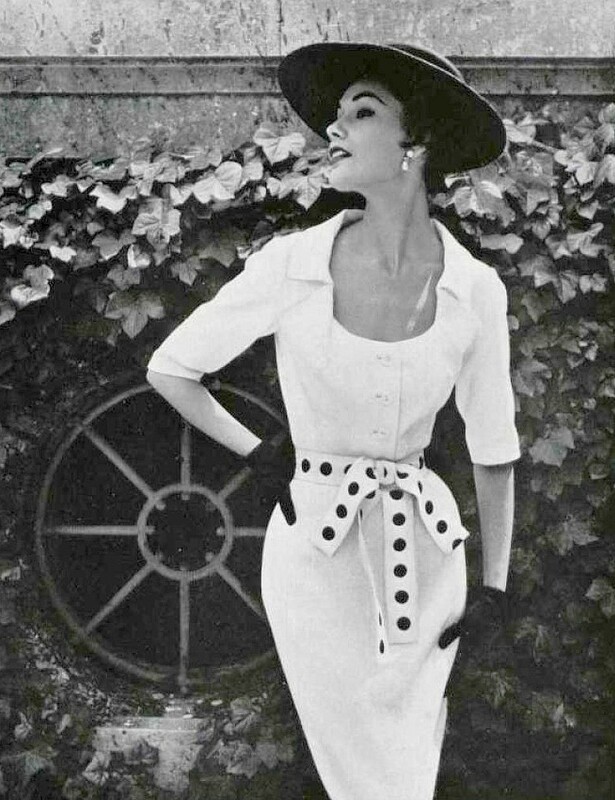 Nothing says 50’s fashion better that the elegant boat neckline trend. Not only is the boat neckline super gorgeous for all figure types and necklines, it is also great for almost any occasion. Take this style from work to play and beyond, you name it! Try adding a pair of statement drop earrings for a formal evening look or perhaps sweep your hair up for a more daytime chic look. The legendary style icon Elizabeth Taylor was known for her voluptuous bust, tiny waist and shapely hips. The square neckline was a fashion favourite of Taylor’s as it would not only accentuate her bust line, but also offer her support. She was a women who knew exactly how to dress for her body type and would use fashion as way of accentuating her best assets.The square neckline is still a classic fashion staple today, perfect and practical for any formal function. Although not traditionally known for her style, Jane Russell was a star who knew exactly how to rock a halter neckline. Her statuesque and sassy nature made it the perfect fashion selection for her. This style is particularly great for broad shoulder types or for fuller busts. To achieve a modern look nowadays, we usually opt for a center point halter neck as opposed to a side halter neck as see traditionally in Hollywood during the 50’s. The alluring pleated mini dress was a revolutionary ‘coming of the ages’ step for the fashion world. It was the first time the world sat up and noticed as shorter hemlines began to emerge and women’s rights came to the forefront. The power mini was embraced and women were no longer scared to show a little leg. As seen on icon Bridget Bardot, the striped print mini was a great way of elongating and complementing the figure, today we opt for pleated miniskirts as a way to channel the 60’s vibe. 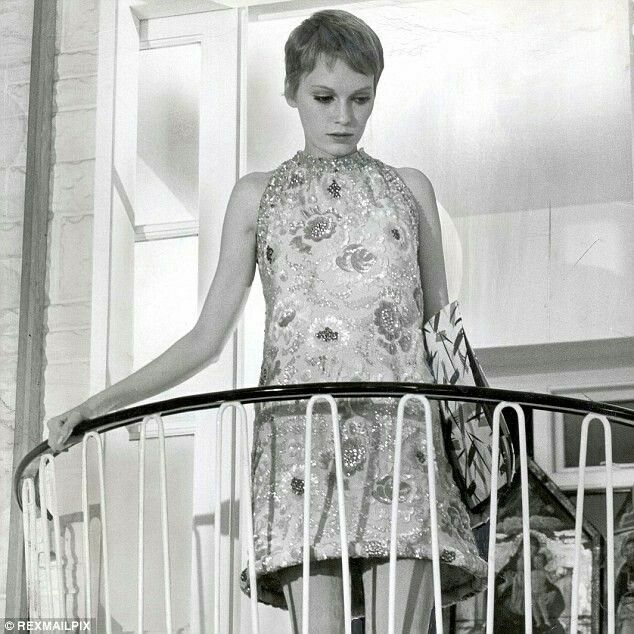 Mia Farrow, an American actress and former model seen here wearing an A-line embellished mini dress. The A-line mini dress was synonymous with all things 60’s and what better way to spice things up and pay homage to the glitzy 50’s than with a little razzle dazzle. The embellished detail along with the soft A-line silhouette is a great accompaniment of subtle glam. The iconic model Twiggy has to be, without a doubt, the poster girl of 60’s fashion. This British beauty was famous for her super slim frame and pixie hair do. The geometric printed mini works well with a petite frame and creates a dynamic flare, perfect for that super chic weekend brunch look. For a contemporary look team your printed mini with a boldly coloured tailored jacket. Creating one of the most pivotal moments in fashion history, Jean Shrimpton shocked the crowds by wearing a white shift mini dress to the Melbourne Cup festival in 1965. The English model is said to have unintentional worn the mini dress that measured a mere 4cm above the knee, stating that her dressmaker didn’t have enough fabric to complete the dress. The shift dress has become a closet staple in contemporary times with a shorter hemline and off the shoulder neckline. The irrepressibly cool English actress is iconic for her effortless fashion styling and it has to be said when a bag is named after you (Hermes Birkin bag) you know you’re doing something right. Birkin is known for her minimalist fashion styling like the gingham print as see above. Recently the gingham print has made a comeback and has been adapted with a slightly more fitted silhouette. Known as one of Warhol’s superstars, Edie Sedgwick an American actress was the epitome of all things 1960’s. Her eccentric minimalistic style was a credit to her modeling background. She opted for bold stripe prints and always seemed to pair her super short dress tops with a pair of black stocking tights. Today we see the striped top trend used commonly as a layer, for example under an overall mini as see above. It’s virtually impossible to talk about Stevie Nicks without talking about fringe and ruffles. A fan of anything oversized, Stevie loved to play with textures and layers to create a billowing silhouette. She was often spotted mixing and matching different materials and fabric, making her bohemian influence style truly iconic. The major trend of the moment is anything of an oversized nature featuring an abundance of ruffled textures, for example the ruffled skirt. The ever so soulful Diana Ross is a true master of her craft, with a successful music and acting career to show for it. Diana catapulted to Queen status as a fashion loving musician that understood the importance of performing and costume design. Her fashion mixed flawlessly with her music as she channeled the subtly smooth sounds of soul with rich satin fashion numbers. Fall endlessly in love with a satin night-gown inspired evening dress at your night time function. Angelic blonde bombshell, Farrah Fawcett was known as being the quincentennial quintessential girl next door. Her fresh faced complexion and outward layered curled hair made her the ultimate American girl next door. Farrah thrilled in this golden chain mail dress at the 1978 Academy Awards making it one of her most iconic looks ever. Metallic sequined dresses are still all the rage and are favoured by many for their special formal occasion. Opt for a shorter length in hemline for a modern twist. Cher has never been one to be scared of daringly bold fashion options and has always kept it interesting and fun with her individual iconic style. The powerhouse vocalist is synonymous with all things sheer. From her 1973 Academy Awards outfit to her 1974 Met Gala feathered number by Bob Mackie, Cher always likes to push the boundaries when it comes to showing some skin. This look is so on trend at the moment, sheer skirts and embroidered netting are the perfect choice for the upcoming summer season look. The infamous wrap dress is a trend that has set its mark as a classic fashion staple. Brought to life by the remarkable Diane Von Furstenberg in 1974, the wrap dress has become so influential that it has rightfully earned a spot as a timely fashion piece. The wrap dress is so versatile and easy to wear, hence its vast popularity amongst fashion lovers. Go classic with a bold 60’s print or keep it fresh and modern with a solid coloured jersey fabric. Dating back from as far as ancient times, the maxi dress trend has stood the test of time. Incredibly easy to wear and indulgently luxe, maxi dresses are an extremely effortless fashion piece to wear as seen on Bianca Jagger. Opt for a style with pleats or bias cut layering in the skirt for an ultra-glamorous feel. Use a contrasting coloured belt to cinch the waist and you’re guaranteed to feel like a true goddess. Princess Diana was a prominent fashion icon of the 80’s. The world fell in love with her grace and her beauty, but most of all with her style. Whether she was visiting an African orphanage or attending a red carpet event, Diana always wowed the fashion crowds. Her signature 80’s style was the exaggerated shoulder trend which she pulled off remarkably well due to her broad shoulders. Contemporary versions of the exaggerated shoulder trend can be created using a layered shoulder padded shirt worn under a strap dress. One word … Madonna! This one word is all that is needed when talking about fashion influencers in the 80’s. Madonna has never be one to shy off wearing naughty negligee inspired fashion pieces. The controversial Queen of Pop made history in an exaggerated bustier corset top designed by Gautier which she worn on stage during her 1990 Blonde Ambition tour. This ultimately redefined the female figure and challenged how undergarments could be worn. Today we embrace underwear as an outerwear trend and opt for lace bra peek-a-boo inspired pieces. Demi gave us an ‘indecent proposal’ we could not refuse in this elegant number from her 1993 hit movie. The beautiful gown featuring cutouts in the neckline worked extremely well and created a harmonious balance between drama and elegance. The 80’s evening look was a powerfully dynamic style that has become a classic pick for the coveted Gala ball function. A timeless trend that has been see today using textures such as leather for a more contemporarily demure look and feel. Think of any John Hughes produced teen movie actresses from the 80’s and you’re bound to think of Molly Ringwald. The 80’s teen screen queen is associated with all things ‘pretty in pink’ thanks to her 1986 smash hit movie. Molly’s character known as Andie wore a pink dress in the cult teen drama that has become one of the most fashion iconic moments of the decade. While the over exaggerated 80’s puffy sleeve may have dated, in more recent times we have seen the pink polka dot trend re-emerge and become popular once again. Michelle Pfeiffer’s wardrobe from the action packed film Scarface most definitely did leave a long lasting impression. It is said that a plethora of actresses of recent years have become inspired by the super sultry look of the 80’s featuring plunging necklines, silky materials and relaxed silhouettes. This super indulgent femme fatale look owns its charm to high slits and daring necklines. Try it at your next function and you’ll be sure to thrill. Brooke Shields, the model brain child of the 80’s, rose to fame in the 1980 film Blue Lagoon captivating audiences with her youthful glow and glistening long luscious locks. This eighties power model knew how to rock the metallic jumpsuit trend. Lavish shiny textured fabrics and exaggerated puffed sleeves made this look a party winner. For a rock star worthy fashion look, choose a tailored metallic pantsuit for your next Saturday night party event. For more tips on trend based fashion read our Summer Fashion Trends 2017/18 Blog post.